In a previous post, I wrote about identifying how many designers your company may need, as well as advocating for those roles. Below, you will read my thoughts about attracting and vetting UX design applicants. UX Designers are in huge demand right now. The role in general is expected to have a steady 18% job growth in the next 10 years. I have seen numbers that are closer to 30% growth in the number of UX jobs since 2013. Simply put, it is hard to find talent and to keep it because demand is high. Plus, median salary for a UX Designer is in the $90,000 range nationally. This leaves a lot of companies unable to compete on salary and add the amount of resources they need. There is another thing: the average national salary for Web Designers is in the $50,000 range. This is problematic, because most Web Designer or pure visual design portfolios can look very much like that of a UX Designer. This requires that someone familiar with the industry vet experience, review portfolios, interview, and create/cultivate a culture that allows you to hang on to your talented hires. One other thing to avoid when trying to attract folks is exhaustive job descriptions. Unless your company has a high level of UX maturity, it is doubtful you will be able to attract designers that are happy and competent at ethnographic research, front-end development, ‘rock star’ design and communication. My recommendation would be to specialize or hire a director-level designer to scale a team. We would like to take up to 30 minutes of the interview and have you work out a problem on the whiteboard. For this, there are no wrong answers; the team is mainly interested in seeing how you work through a theoretical UX challenge. We will provide you with everything you need to complete this task and you won’t need to prepare anything in advance. When they arrive, we typically give a tour of the office, then we sit down and explain the challenge in greater detail. We give them a handful of prompts, like the below, to choose from. Once the candidate picks a challenge, we provide a lot more ‘research’ on the problem to help guide a solution. For the challenge itself, we draw three columns on a whiteboard and let the candidate go to town. Below is how we describe what we are looking for in those 30 minutes. 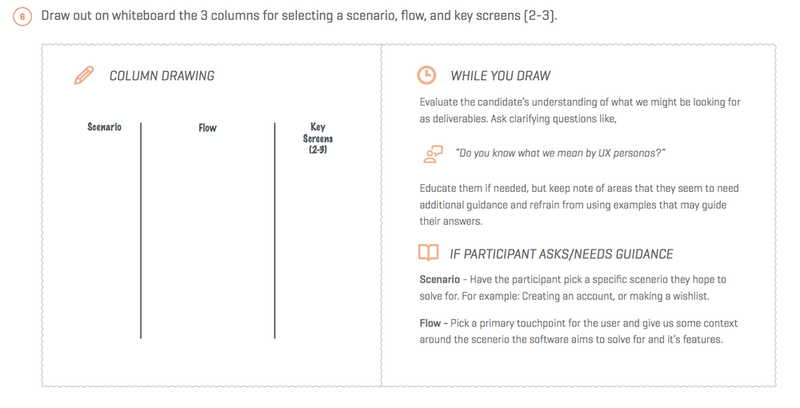 The best solutions to the challenge include a high amount of context into the scenario the participant selects, and tend to be highly visual and well articulated. Again, this isn’t a pass/fail test; it is more an opportunity to observe their process in action. Can the candidate articulate rationale for business decisions made along the way? Where was there tension, and how did he or she compromise? What was the extent of involvement in the project? What did the candidate do to empathize and understand the needs of the end user? Did it get made and, if so, what was that process like? Lastly, after each interview, we do a couple things. We normally have a retro where we discuss the session at length. We also document in the same way for everyone. Frequently, when I interview, it is difficult to remember what I really enjoyed/had reservations about with each candidate. Sometimes, the initial interview can happen months before the team makes the decision to extend that person an offer. Having a way to go back and see detailed notes helps immensely.